Help Start a Grammar Revolution! Home / Blog / Help Start a Grammar Revolution! Lots of grammar-crazy people come across as cranky and ornery. I think that’s why Grammar Revolution caught my attention. The folks who run it — Elizabeth O’Brien and her husband David — come across as so stinkin’ nice. And I’ve never met anyone with half of Elizabeth’s enthusiasm for sentence diagramming. Come to think of it, I’ve never met anyone with any enthusiasm for sentence diagramming. Anyway, I stumbled across their site a few weeks ago and shared some stuff on Pinterest and Facebook. Then I found out about their documentary project. 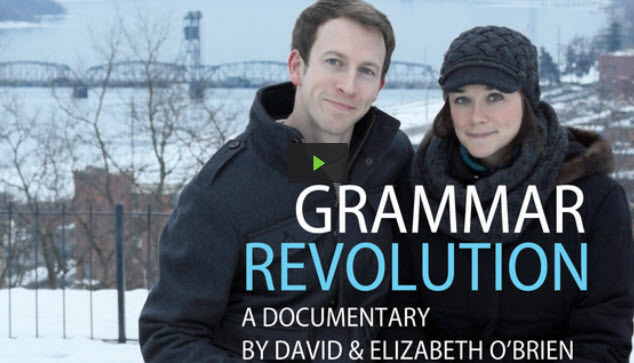 The O’Briens have begun a documentary on the subject of grammar. In particular, how it’s taught (or not taught) in American schools. What they have so far looks intriguing, and it might just contribute something useful to the ongoing conversation about education in this country. WriteAtHome made a small contribution to the documentary project, and you can too. They are using a popular website called Kickstarter to raise the funds to finish the film. You can help out for as little as $5. WriteAtHome: We Teach Writing for You! Diagramming sentences is my favorite part of school! :O I LOVE sentence diagramming. It’s completely structured and so nice and neat. I never did care much for grammar until I started using a program that taught sentence diagramming. For me, it’s a way for the “math” side of me to come out in a very “non-math” subject. Well, there you go. Now I know someone!